"Folks, force production is great and the reality is that any sound strength and conditioning coach knows that there need to be MANY tools in his/her toolbox so there is a place for strength-based exercises. The problem is that TIME is a huge factor in sport performance. Sure, force production is great but if you can't produce it FAST ENOUGH, the play is over. Take a look at this graph. It compares three groups, a strength training group, an explosive training group, and a group that did NOTHING. At 200 milliseconds (the time in which most critical athletic movements occur), the power training group is blowing everyone away. The untrained group is right with the strength training group at this time period...remember that they did NO TRAINING AT ALL!" It's a real pretty graph and probably takes in some folks who only look at the picture and don't think about what it's telling them. This graph reminds me of one of those "what's wrong with this picture" games they used to put in the Sunday papers comics section. The longer you look at it the more you will find wrong with it. Here are the key things that jump out at me as being completely missed in the graph. First, let me say that it's a real nice graph, I would presume it came from a study of some sort, but the website I got this from gives no indication of that by way of mention or citation. To elaborate, the critical things we don't know are the scale of the force, and the movement performed in the graph and if the "heavy resistant strength training group had practiced the movement. The the scale of the force dimension critical, how else are we to tell that the difference between the groups are significant. What if the differences in force at 200 ms are less than 1 lb? 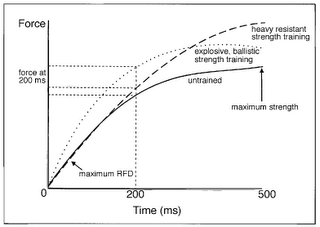 Would that make you think differently about the "benefits" of explosive, ballistic lifting? It's certainly worth not risking your athletes' health so they can express an additional pound of force at 200 ms. StrongerAthletes.com maintains it's never worth the risk of additional injury, regardless of the benefit, supposed or otherwise. Another missing piece of the puzzle is what movement was this that was performed? If the test is to be valid at all it should be a movement all three groups have the same amount of experience performing. Due to specificity we know that practicing a movement will make you better at it. So if the three groups tested hadn't performed the same movement before or performed it for a similar number of times in their life, one group may perform better just because they practiced the movement more and the type of training they undertook had no effect at all. It's a pretty graph, but it proves to be pretty much useless for any real information to base a conclusion upon without more information, but then I think the author hoped you would just look at it and not think about it. If anyone has seen this or a similar study feel free to give a citation.